Discover Wat Pho temple, with its massive reclining Buddha statue, and listen to the musical sound of coins dropping into brass offering bowls, following your welcome briefing. Then, Ride Like a Local on a tuk-tuk around the sprawling Grand Palace. Explore the ancient Siamese court, home to Thailand’s most important shrine, the green-jade Emerald Buddha. Next, gather for a light lunch aboard a traditional wooden rice barge. Cruise the quiet Chao Phraya River in a relaxed atmosphere, taking in the wonderful views. Later, fly to Siem Reap, Cambodia, and transfer to your traditional, Khmer-style boutique hotel. Today, Ride Like a Local through Phnom Penh, Cambodia’s lush and alluring capital city, on an engaging cyclo tour. Discover the ornate Royal Palace and wander past huge stupas, spirit houses and potted flowers en route to the famous Silver Pagoda, home of Cambodia’s Emerald Buddha and the diamond-encrusted Maitreya Buddha. Visit the National Museum this afternoon. Later, learn about Cambodia’s darker days as you walk the notorious killing fields of Choeung Ek. Sense the somber atmosphere of this, one of history’s most infamous places. Then, leave behind that bleak period in Cambodian history to attend an uplifting performance by children from a local orphanage of Apsara, the country’s national dance, which you enjoy on the sun deck of your ship. 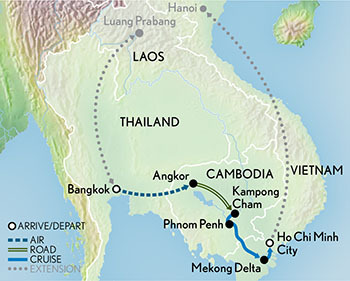 Sail into Vietnam and cruise downstream to little-known Hong Ngu, which nimble ‘Mekong Princess’ can enter with ease. In this place few Westerners have ever been, experience an especially friendly welcome, followed by a visit to a local family home, where you watch the weaving of kormas (traditional Khmer scarves), which are exported to Cambodia. Later, explore a local temple dedicated to Hòa Hóa, a unique Vietnamese religion. Begin the day with a sampan (wooden boat) ride to the riverside market town of Long Xuyen. Walk the bustling market and then visit the Cao Dai temple, where a compelling Vietnamese religion was founded as an amalgam of different beliefs to harmonize relations between various followers. Later this afternoon, sail to the village of Thot Not. Here, ride a xe loi (motorized trishaw) through the village to a sanctuary filled with the cacophony of birdsong. Following a short walk into the sanctuary, climb the steps to the viewing platform, where an incredible view spans treetops and the nesting area of protected egrets. Rise early for a sampan cruise through the fascinating Cai Rang floating market near Can Tho. Weave between the many boats that sail into the market each morning to sell produce and goods. Grab your camera: This is the place to capture brilliant photographs of a dynamic market life. Fresh coconut water, the Vietnamese “anti-aging drink,” refreshes you before a stop at a local factory to see the making of instant noodles. 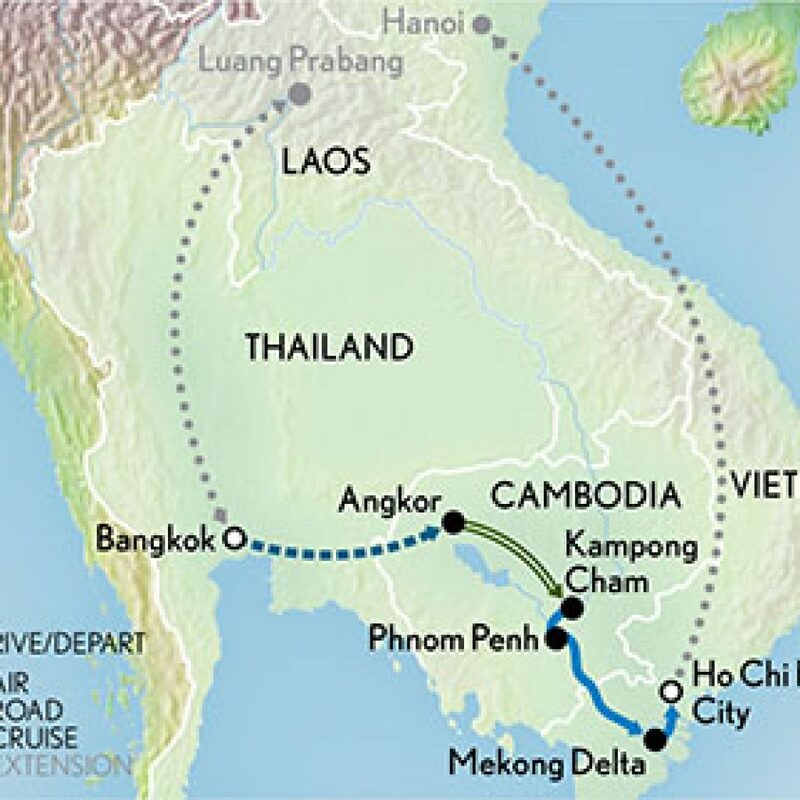 Back on board ‘Mekong Princess,’ sail deeper into regions of the Mekong Delta rarely touched by travellers to see Phuoc Hau Pagoda. At this important Buddhist temple that dates back to the fourth century, interact with local monks to learn about their daily life and practices. Unlike other river ships that are forced to dock outside of Saigon, the swift ‘Mekong Princess’ takes you right into the heart of this lively, evocative metropolis, which today goes by the name of Ho Chi Minh City. Recently experiencing a resurgence of art and culture, the city is a hub of activity. Bid farewell to the crew of ‘Mekong Princess’ and set out to discover the city’s colonial legacy, including the Central Post Office, the Notre Dame Cathedral and the Opera House. Continue your exploration with a tour of the History Museum and the colorful Ben Thanh market. Then, drive past the former U.S. embassy building, from which helicopters carried off the last American personnel remaining on site before the city fell to the Vietcong in April of 1975. Observe as you go, the vibrant, bustling energy of a people on the move, wholeheartedly embracing the trappings of western culture, as giant images of “Father Ho” gaze out at streets streaming with the latest-model luxury automobiles. Tonight, gather with your fellow guests for a special farewell dinner. Hotel (4 nts), ‘Mekong Princess’ luxury cabin (7 nts).